Lemonade is what kids tell unsuspecting customers they are buying at their curbside stands for 5¢, just before giggling as they watch them drink it. This well-known summertime beverage is supposedly made from lemons, but also contains copious amounts of sugar, and is heavily watered-down to save on production costs. The earliest known records of lemonade come from Egypt around 700 B.C., at a time when lemon trees grew like weeds and the Pharaoh had a real problem on his hands. His creative solution proposed to farmers in his kingdom was to harvest the fruit of these trees and drink its juice, replacing the lost nourishment from their failed crops. This initiative was a resounding success; however, irresponsible cultivation practices led to a lack of water for irrigation, reducing Egypt's wide stretches of farmland to the desert it is today. The resulting famine and uprising explain why the modern Egyptian government has a curious lack of Pharaohs. By 1600 A.D., the French finally found a way to responsibly cultivate the lemon tree without destroying their agricultural industry, leading to a resurgence in lemonade's popularity. This was originally carried around in large tanks on their banks, until the modern invention of the beer hat. When one requests lemonade at a cafe in France, straight lemon juice is served, alongside water and sugar for wussy foreign tourists. The most common form of lemonade is prepared using only three ingredients: lemon juice, sugar, and water. First, fresh lemon juice is extracted from lemons by utilizing an industrial press similar to that used for making apple cider. The lemons are crushed with approximately 500 PSI of pressure until they stop screaming, all while their bodily fluids leak out through pores in their rinds into a collecting basin. Next, sugar is added to the juice, which further enhances the acidic juice's ability to erode tooth enamel during consumption. It also lends much-needed sweetness and calories to the beverage, because no proper soft drink should ever be mistakable for something healthy. Finally, the drink is diluted with water. 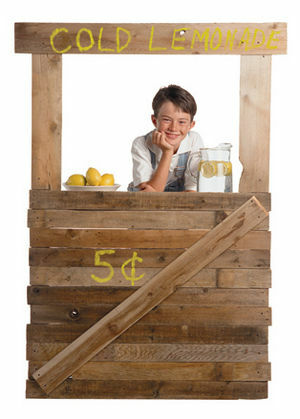 In this way, just one lemon and a pound of sugar can yield more than 30 gallons of lemonade, which is why it can be sold for just a few cents at any child-operated stand. When properly diluted, lemonade can also be used as an excellent homeopathic remedy for scurvy. For those without comedic tastes, the so-called experts at Wikipedia have an article very remotely related to lemonade. These limes are ready to make a tasty beverage...or not. All lemonades can be generally categorized as either "cloudy" or "clear", depending on the number of foreign contaminants present. The lemonade served in the United States and India is deemed cloudy, often because the snot-nosed children making it sneeze into the pitcher. European lemonade is called "clear", because it is clearly not actual lemonade but a rip-off of Sprite. The industrial presses used to extract lemon juice can be dangerous to operate without years of experience. Accidents are not uncommon, as children's hands can get caught in the press, which adds a small amount of blood to the juice. However, the juice is often used anyway rather than being discarded, leading to the origin of the phrase, "When life gives you lemons, make lemonade." Since lemonade is such a popular beverage worldwide, farmers typically have a hard time producing enough lemons to meet the combined demand of both beverage makers and the used car industry. In an effort to speed up production, some have started harvesting the lemons well ahead of schedule, producing the unripe variant known as limes. Lemonade made with limes instead of lemons is called "limeade", and its taste is appropriate to its rushed level of quality. This page was last edited on 6 July 2016, at 23:59.